Click Here to Begin Slideshow Image from screenshot. 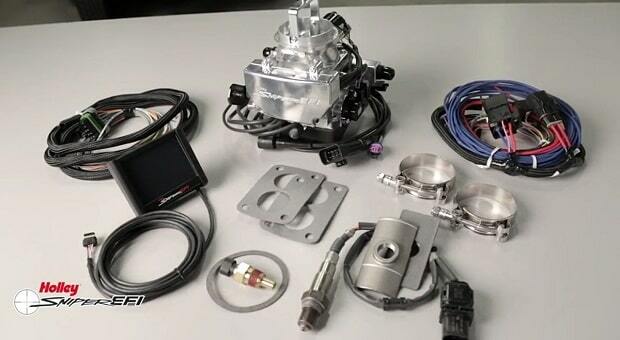 You probably thought that in order to get the benefits of electronic fuel injection - such as cold start reliability, accurate fuel feed even at precipitate angles on the trail that would kill carbureted engines and an end to vapor lock on your ’73-’86 Jeep CJ with the BBD carburetor - you’d have to pull the intake and spend big bucks. Not true. 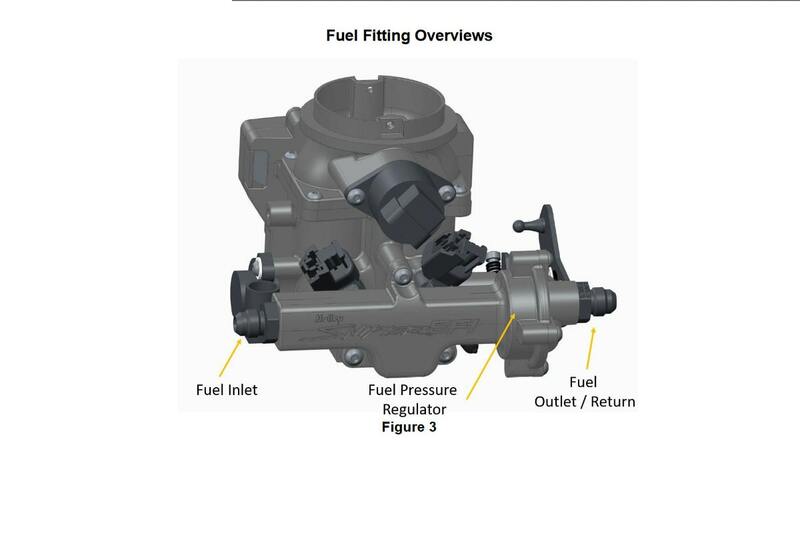 You probably thought that in order to get the benefits of electronic fuel injection - such as cold start reliability, accurate fuel feed even at precipitate angles on the trail that would kill carbureted engines and an end to vapor lock on your ’73-’86 Jeep CJ with the BBD carburetor - you’d have to pull the intake and spend big bucks. Not true. 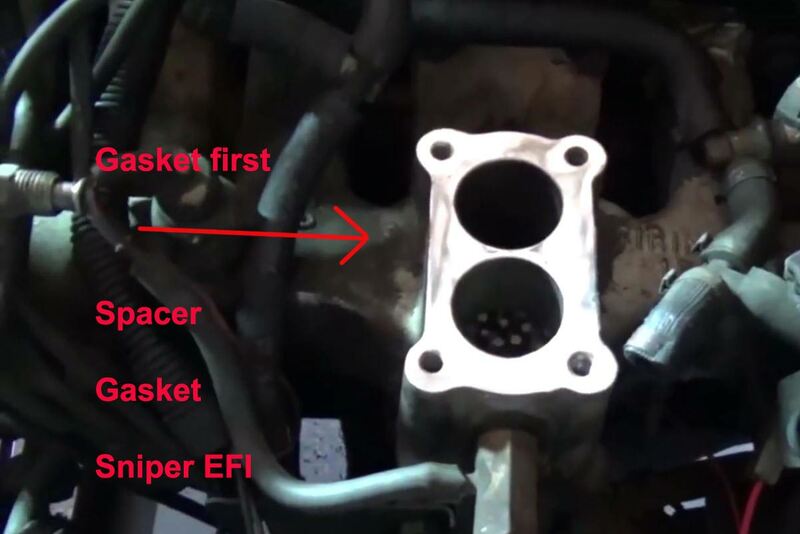 Sniper now has an EFI system that’s a direct bolt-on replacement for the BBD carb on Jeep CJs with the straight-six 258. 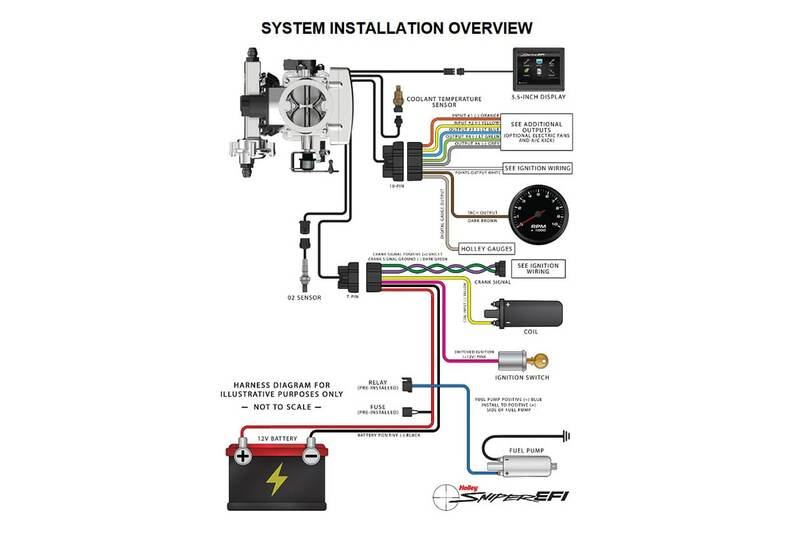 The hardest part of the install is making the four wiring connections (If your fuel system can operate at 60 PSI. If not, a fuel system upgrade will be required.). All you need is a few hours and your CJ can have EFI. Disconnect the battery. Although not every vacuum hose or electrical line will be re-used, label everything attached to the BBD. 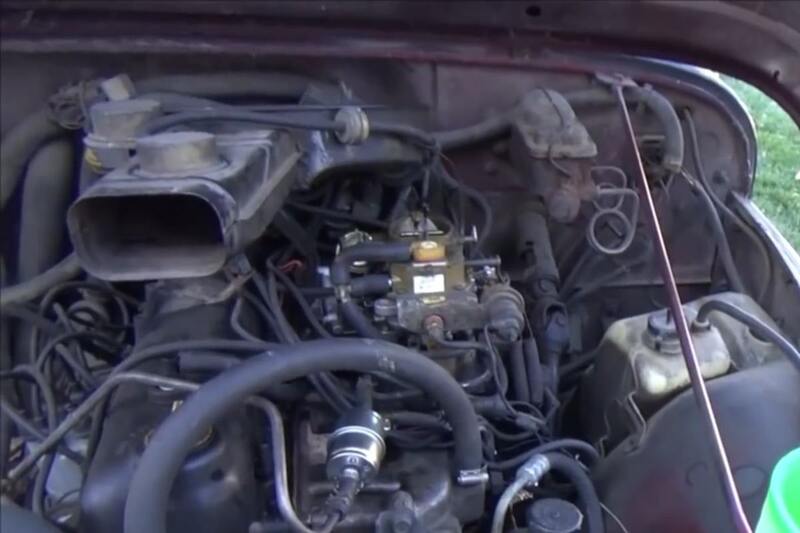 Disconnect the fuel line and vacuum hoses. Disconnect the throttle linkage. Remove the four half-inch bolts securing the BBD to the intake. Remove the carburetor. Shove a rag or towel into the intake openings and clean the mating surface completely. I prefer to use a small gasket cleaner on my cordless drill. Slide the new gasket onto the intake. Place the Sniper EFI for Jeep CJs unit onto the intake. Install the washers and thread the nuts on. Tighten the nuts to 60-80 in-lbs in a crossing pattern. 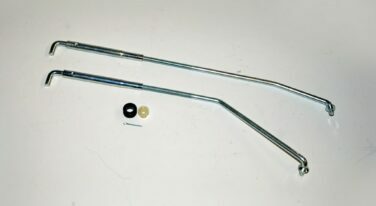 Reconnect the throttle linkage. Make sure the pedal can move freely and adjust as necessary to free up the pedal/linkage. Locate and remove a 3/8 inch NPT plug in either the head or intake. Route the temperature sensor to this location and apply three to four wraps with Teflon tape. Install the sensor and tighten. The old BBD had a number of vacuum hoses that the new Sniper EFI won’t need. 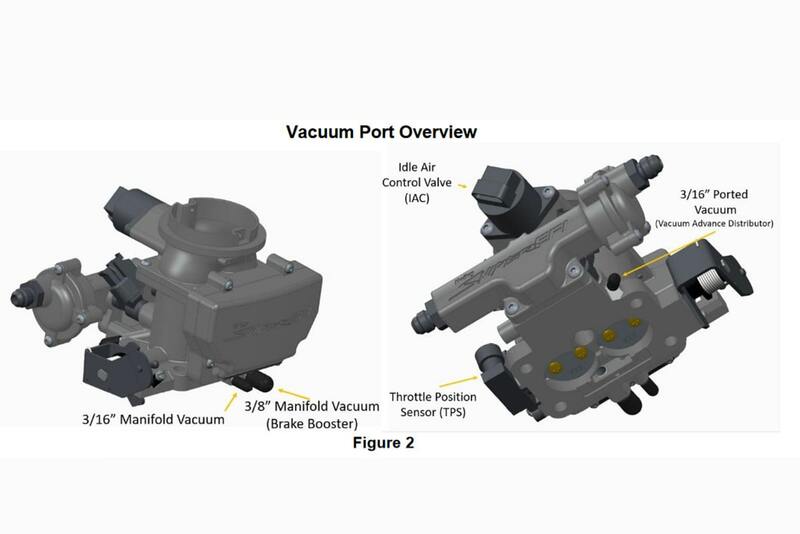 Manifold vacuum and the brake booster are the two main vacuum connections required on the Sniper EFI. Distributor vacuum advance is another. 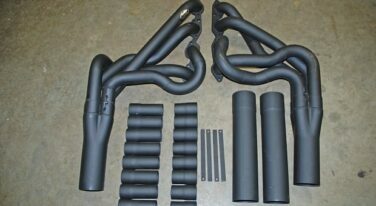 Trace any unused vacuum hoses to their source, then remove and cap them. Hook up the fuel supply and return lines. The supply has to go the supply side on the EFI unit and the return must go to the regulator. Looking at the idle air control (IAC) valve, the fuel inlet is on the left. On top of the Sniper EFI unit is an air cleaner bale that allows you to use the factory air cleaner. Place the air cleaner outlet over the Sniper inlet and attach with the factory wingnut. 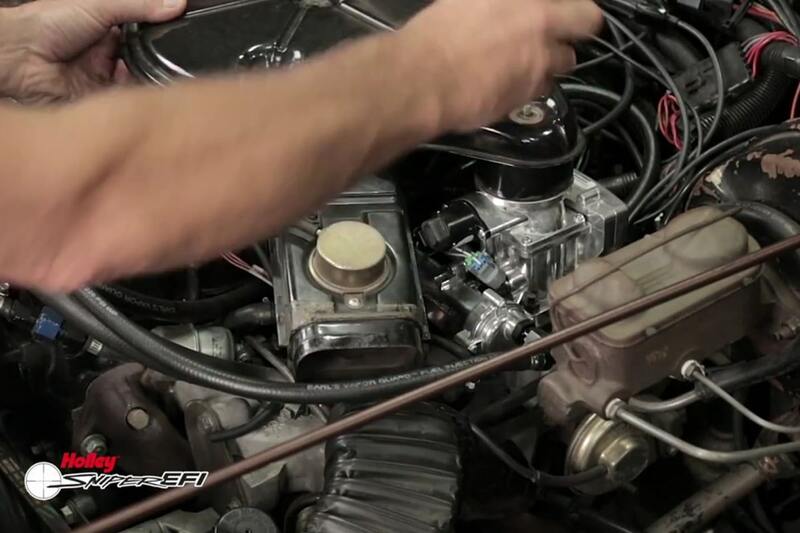 The Jeep CJ BBD Sniper EFI needs an oxygen sensor to maintain the proper air-fuel ratio (AFR). 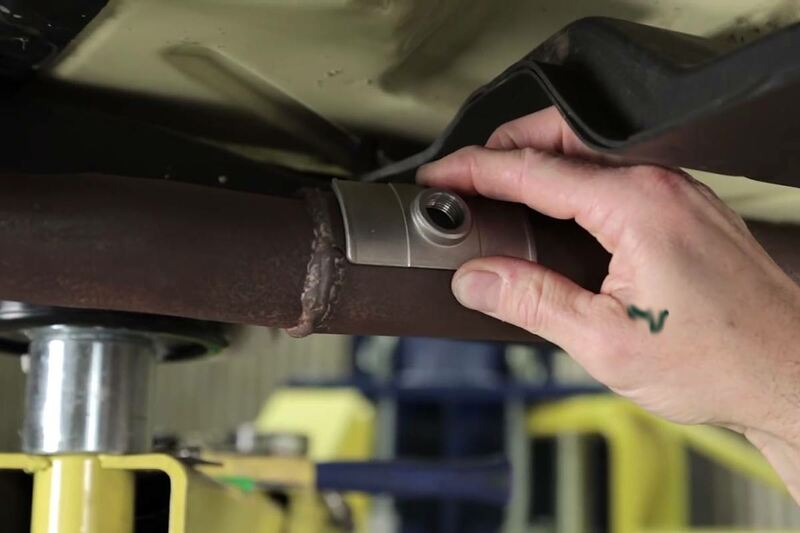 Drill a 7/8 inch hole in the exhaust pipe as close to the engine as possible. Drill this hole after the collector if you have a header. Also, make sure the sensor can sit at least ten degrees above horizontal if the pipe chosen runs horizontally. Fit the gasket and sensor mounting plate over the hole and slide the two supplied clamps over the ends of the plate. Tighten the clamps as much as possible to ensure there are no leaks. 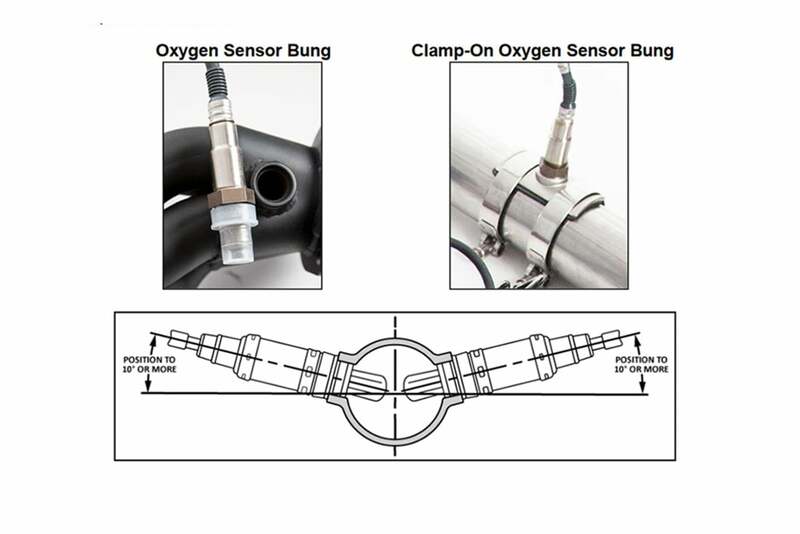 Install the oxygen sensor using heat-resistant anti-seize compound. 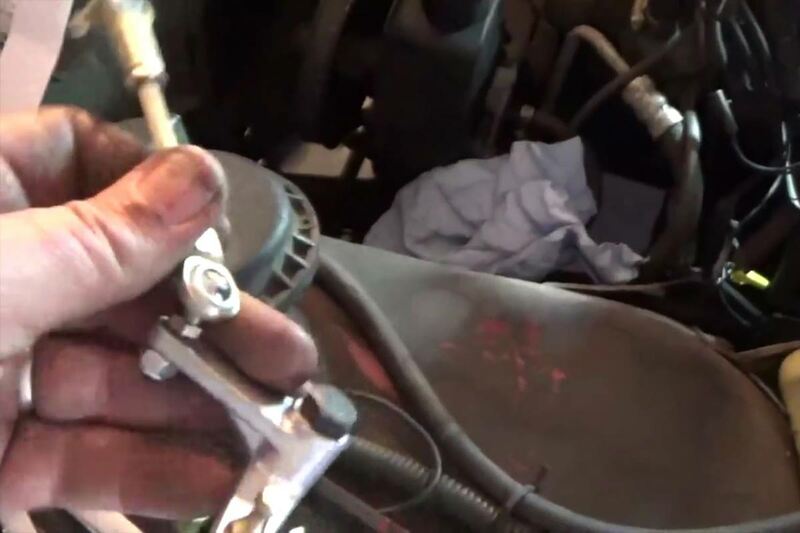 Connect the O2 sensor to the corresponding lead on the EFI unit. You could also weld the O2 bung onto the exhaust pipe. Just make sure your weld is good. 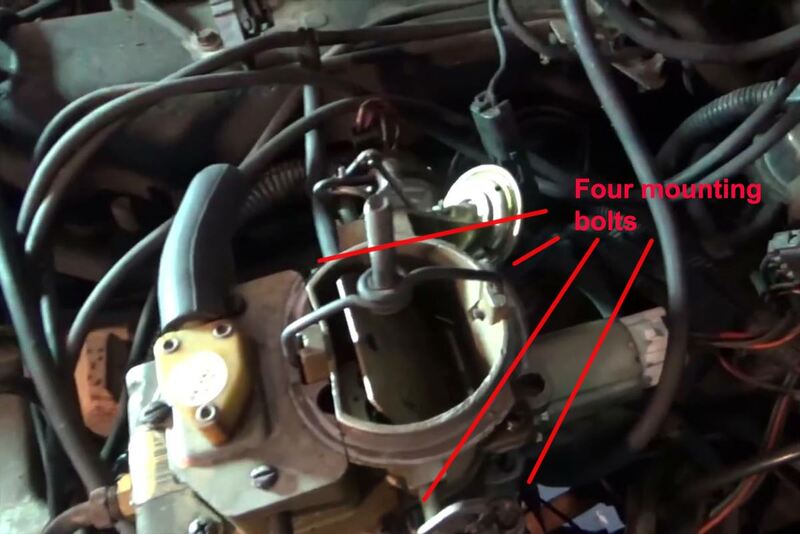 If you’ve got a stock ignition system, attach the yellow wire from the three-wire connector to the coil negative and the brown from the two-wire connector to the tach output. If you’ve got a CD box, the three-wire connector is connected to the purple wire from the box and the brown goes to the tach output. NOTE: Use a QUALITY crimp tool, not the cheapest you can buy. Use a test light or volt meter to find power when the key is in the ‘Run’ AND ‘Start’ positions. I recommend using this lead to switch a relay straight off the battery. If you tap into the coil, it may not get enough energy to properly fire the plugs. NOTE: I will repeat - find a power source that is hot both during cranking and engine run and use this to switch a relay powered directly from the battery. Don’t wire the pink wire from the Sniper EFI unit to the switched power source. You could just plug the display controller into its plug from the EFI unit and set the 3.5 inch display on the cowl to do the initial programming and calibration. Route the controller cable through a grommet in the bulkhead first so it can be used while driving. Without fail, the power and ground cables must go directly to the battery. This may require that you change either the battery cables or the terminals. Reconnect the battery. 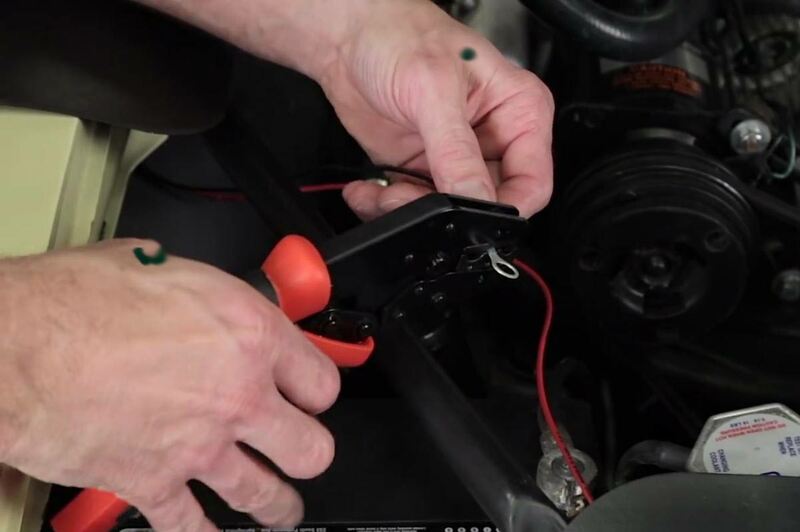 NOTE: Again, if you have to, install new battery terminals so you can connect the EI directly to the battery. •	Select the ‘Wizard’ icon on the touchscreen. •	Scroll down to select the correct installation type (BBD Sniper). •	Select the number of cylinders (Six). •	Slide the input bar to input the engine displacement (258). •	Slide the input bar to select the desired RPM while at normal operating temp. •	Select your cam type. •	Select your ignition type-coil or CD. 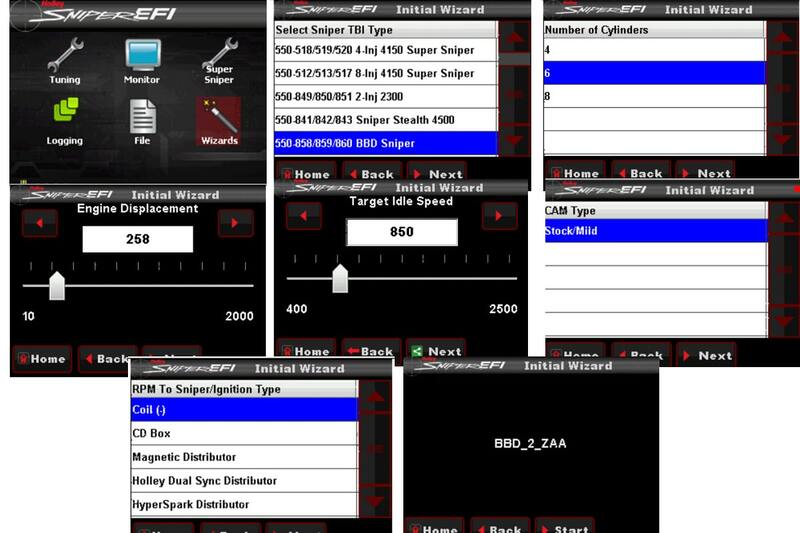 •	The Holley BBD Sniper EFI controller will come up with a base calibration. •	Press the ‘Start’ button to send this calibration to the controller. Once uploaded the controller will give an alert. •	Recycle the key. Listen for the fuel pump cycling for five seconds. NOTE: Check for fuel leaks as the pump cycles. You need to verify that the sensors are all reading and reporting correctly. After cycling the key, the ‘Home’ screen will come up. Select ‘Monitor’ twice. 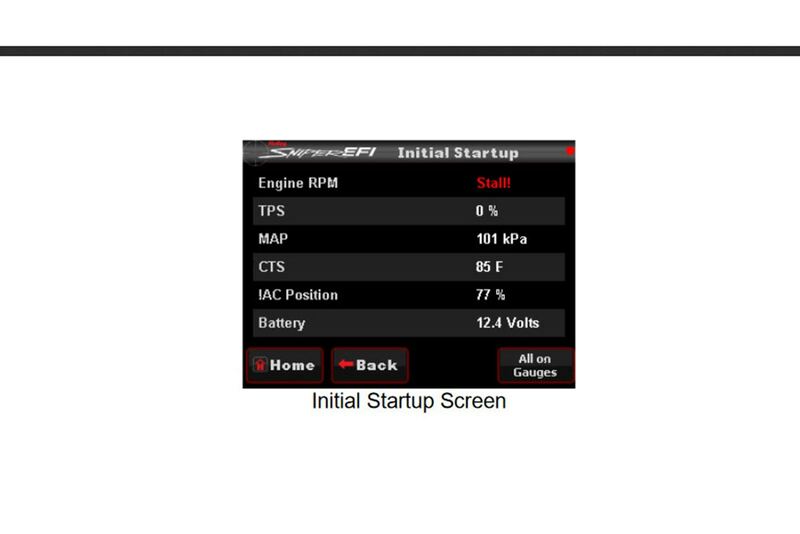 From here select ‘Initial Startup.’ You’ll see monitor readings for five sensors. If any of these are not reading correctly, correct the problem before continuing. 1. Engine RPM-This should read ‘Stall; with the engine off. 2. TPS-Throttle Positon Sensor. Reads “0” with the engine not running. 3. MAP-Manifold Air Pressure. Should read between 95-102 in most locations. Lower at higher altitudes. 4. CTS-Coolant temp senor. Reads engine temperature. 6. Battery-Battery voltage. A minimum of 12 volts is required. Go over everything you’ve done up to now without turning off the ignition. Make sure all vacuum lines and wiring are clear of heat sources, pinch and chafe points and moving parts. Crank the engine while observing the monitor. The RPM reading should change to “Syncing.” Within a few seconds this should change to whatever the engine RPM is. 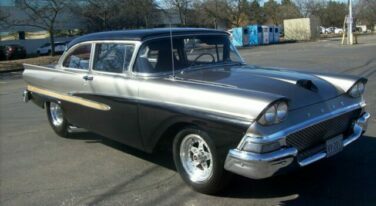 If the engine doesn’t start and come to an idle, go to Holley’s troubleshooting guide and fix the problem. 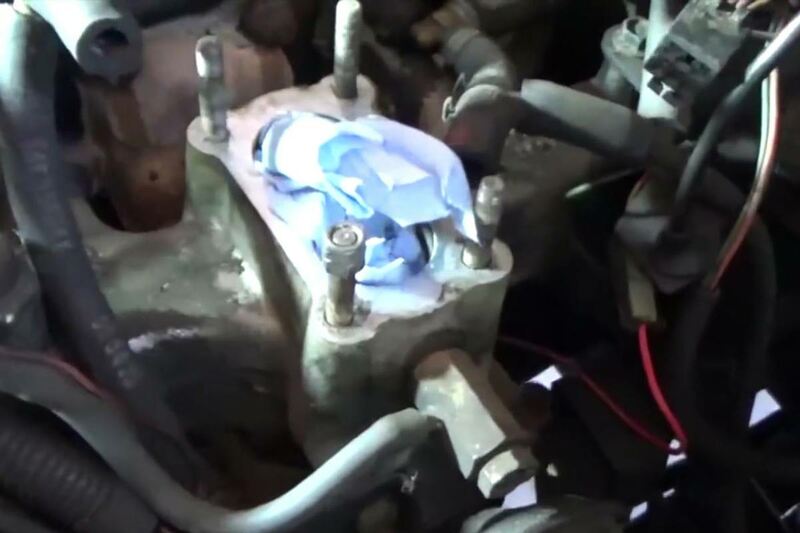 Check for leaks as the engine warms up and top off the coolant if needed. 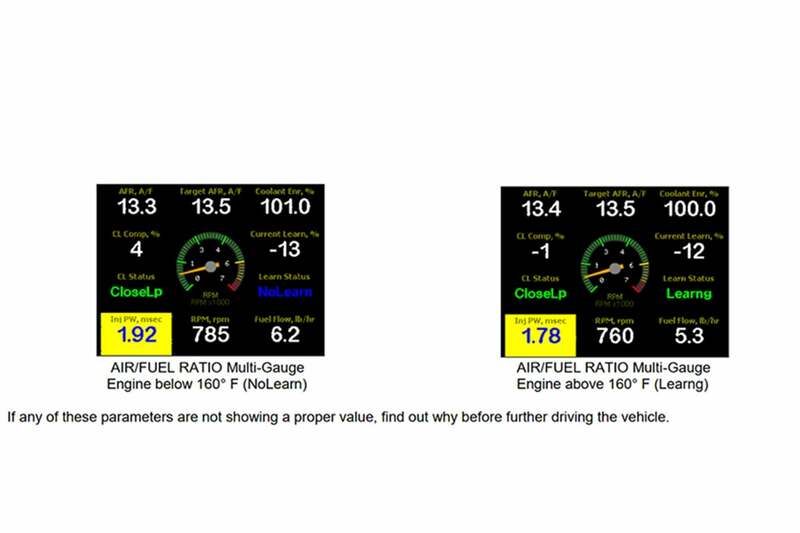 On the handheld, surf through the Monitor, Multi Gauge and then the Air/Fuel Ratio screens. •	AFR, A/F-This should read the air/fuel ratio the O2 sensor is reading. The reading may fluctuate a bit as the engine runs and warms up. •	Target Air/Fuel Ratio-This is what the ECU is trying to maintain as the a/f ratio and will change depending on engine load and speed and coolant temp. •	Coolant Enr, %-This tells you how much of the enrichment the system is adding is based upon coolant temp as a percentage. Once the engine reaches 160 degrees this should read 100 indicating zero enrichment. •	CL Status-Indicates Closed or Open loop operation. Closed means the Sniper ECU is in full control and is controlling the a/f ratio. The Sniper ECU should always be in Closed Loop once the engine reaches 160 degrees. •	CL Comp, %-This tells you the percentage of fuel delivery control the ECU is exerting. A negative number indicates leaning out while positive shows enrichment. In Open Loop during warmup this will read zero. •	Current Learn, %-This should read between -20% and 20% and indicates how much fuel is being added or subtracted based upon the base fuel map in the ECU memory. This can read higher or lower depending on several parameters. •	Inj PW, msec-This is the injector pulsewidth in milliseconds. Innjector pulsewidth is the length of time the injector is open and injecting fuel and will vary depending on engine speed, load, and environmental conditions. •	Fuel Flow, lb/hr-This is how much fuel is going into your engine as an instantaneous reading. A gallon of gasoline weighs about six pounds. Go back to the Initial Startup screen. Set the parking brake and put the transmission in Neutral. Adjust the idle screw until the IAC Position reads between two and 10 percent. 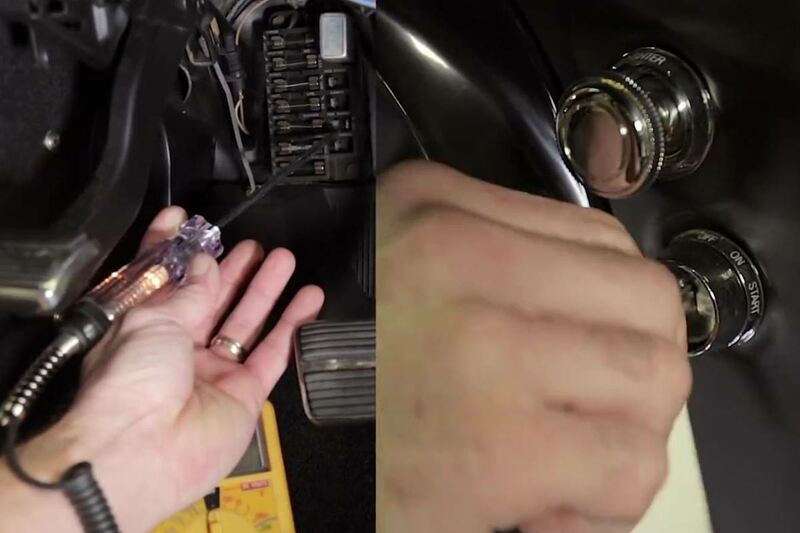 Now adjust the idle speed screw (also called the throttle plate screw) while watching the TPS value. If the value increases, cycle the ignition to reset it to zero. Continue this until the target idle speed has been reached. Head back to the Air/Fuel Ratio screen on the handheld. With the engine at operating temp and the brake set, put the transmission into gear (automatics) and turn on the A/C. Once the CL Comp value returns to zero, you can turn off the aircon if you want and head off for a drive. Don’t jackrabbit from stops. If you have a manual transmission, take longer than normal to disengage the clutch for a bit. Hit and hold city street speeds for a few minutes, then vary your speed a bit for a few minutes until the Comp value returns to zero. Now head somewhere that you can safely do some harder acceleration, including a few wide open throttle (WOT) blasts. You’ve just put the engine through several speed and load variations to teach the ECU. Your Sniper EFI’s ECU will have lowered the Learn Comp Limits enough to transfer the new fuel map to the base map. This will continue to happen as overall driving conditions change and stabilize - for instance, a change in air temp of more than 10 degrees, or if you spend a week in the mountains. Enjoy. 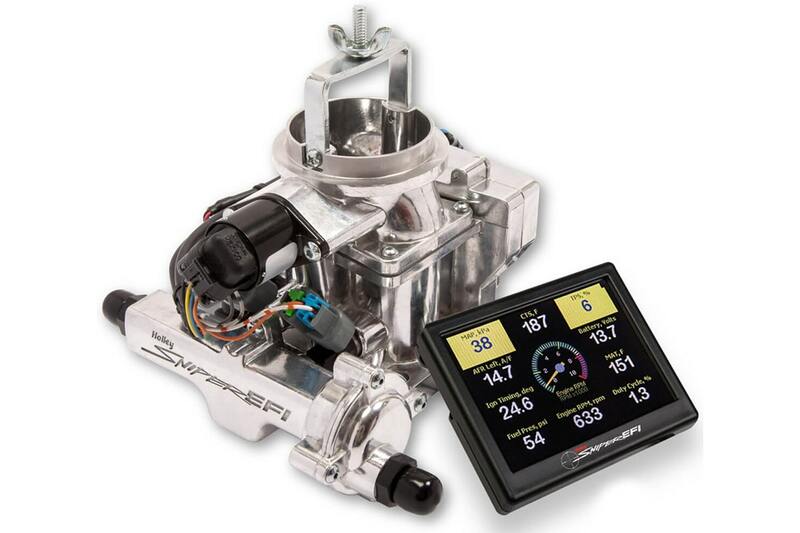 Let us know what you think about the Sniper EFI for the Jeep CJ with BBD carburetor in the comments below.